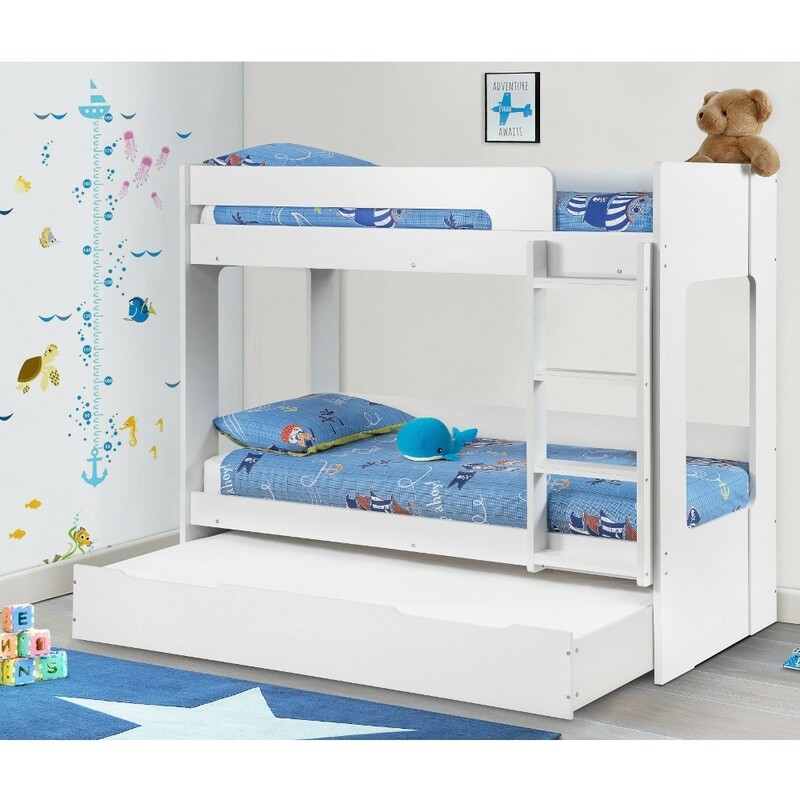 If you’re looking for a new bunk bed for your little angels, then stop right here! Ellie is just what you’re looking for. Ultra-compact and straight-edged in its design, Ellie will fit nicely within your children’s room without disturbing the décor. This is a great space-saving solution that allows you to free up room elsewhere. What’s more, the clean and crisp white finish will allow you to match this furniture with any interior styling. The white colour is also neutral, fitting into any bedroom design, which is great if you have little ones with their own bedroom décor ideas! The chunky wooden ladder is extremely sturdy and robust and a raised guardrail up top will prevent any little ones from falling out at night. This Ellie bunk bed has a unique twist and an exclusive advantage over most traditional bunk bed styles. The twist is that this bunk bed, typically made for two people, can actually provide a sleeping space for three! How? This bed comes complete with an under-bed storage drawer. This drawer slides effortlessly into the space located underneath the bottom bunk. Another mattress can be placed on top of this to create a third sleeping space that follows the standard trundle guest bed style. This is perfect if your little ones are having a sleepover or if you have extra family members round for a party! Simply slide out the trundle guest bed and you have an extra sleeping space. Your Ellie wooden bunk bed will arrive at your home flat-packed and therefore some assembly will be required. Do not fret, though, the provided instructions are easy to follow! As part of the eclectic Domino collection, this particular bed can be perfectly partnered with one or more of the additional pieces of essential bedroom furniture, including the modest Domino 2 Drawer Bedside Table, the spacious Domino 4 Drawer Chest and the accommodating Domino 2 Door Wardrobe. What are the sizes of the three mattresses required? Is this also suitable for adults? The top bunk, bottom bunk, and the trundle all take standard UK size 3ft single mattresses (190 cm x 90 cm). The maximum recommended weight of the Ellie White Wooden Bunk Bed is 11 st (70kg) on the top bunk and 15 st (95 kg) on the bottom bunk.